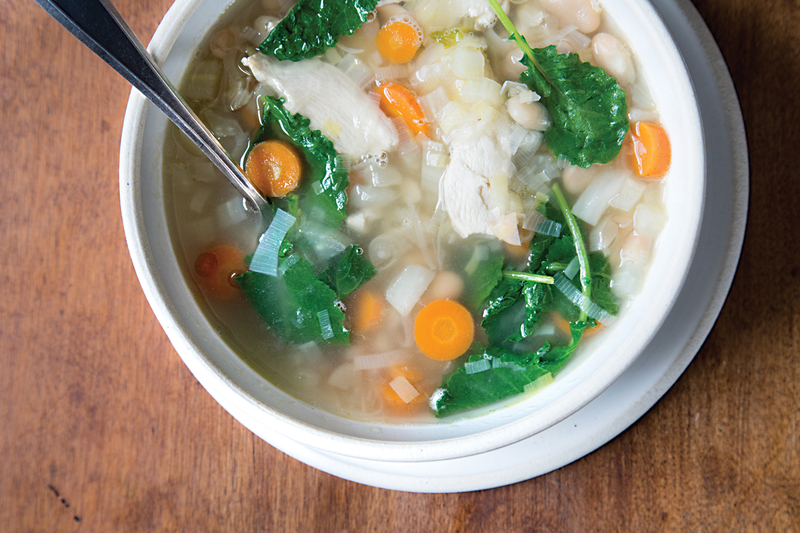 Chicken soup with beans, greens, and homemade stock. *Most dried beans need to be soaked a day ahead of time, then strained, rinsed, and gently cooked in simmering water for 1–1½ hours. Salt at end of cooking process, tasting frequently for doneness in final 30 minutes. In large covered stockpot, sweat onions, carrots, and celery, with touch of salt, over medium-low heat until vegetables soften, about 10 minutes. Place chicken in same pot and cover with water. Add herb bundle and bring water to boil, then reduce to simmer. With slotted spoon, remove any foam that rises. Simmer 45 minutes. Remove chicken and let cool enough to handle. Strain stock into large bowl or other container through fine mesh sieve, pressing liquid from vegetables with wooden spoon. Stock stays good for three days in refrigerator, six months in freezer. In large soup pot, sweat onions, leeks, carrots, and garlic until onions are translucent, about 15 minutes. Add 12 cups chicken stock and picked meat from half of chicken (reserving remainder for another use). Simmer 15 minutes. Add greens and cooked beans. Simmer 1 minute. Season to taste with salt, pepper, and red pepper flakes. Before serving, garnish with chopped parsley.